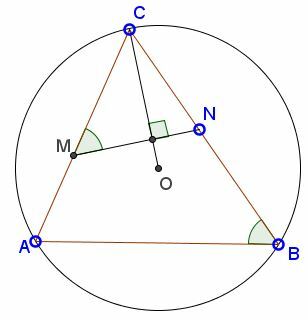 In $\Delta ABC\;$ $MN\;$ is an antiparallel, $M\in AC,\;$ $N\in BC;\;$ $O\;$ the circumcenter. Then triangles $CDM\;$ and $CB'O\;$ are similar. 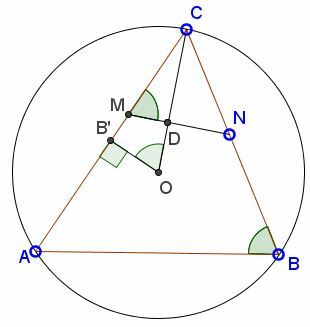 Indeed, they share an angle at $C.\;$ Also, since $AOC$ is a central angle in $(ABC),\;$ $\angle AOC=2\angle ABC,\;$ implying $\angle B'OC=\angle ABC=\angle CDM,\;$ the latter because $MN\;$ is an antiparallel.